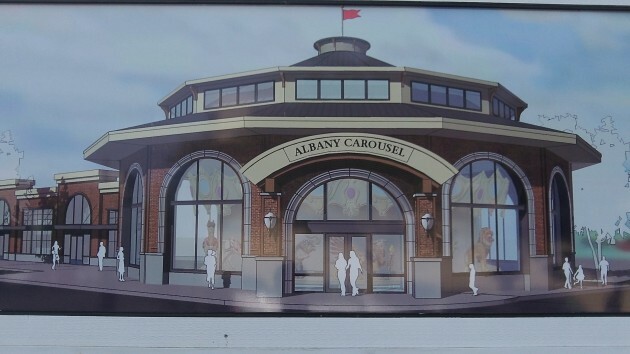 For a dozen years or more the Albany Carousel and Museum has been working toward the day when people can actually ride its restored antique merry-go-round. Click on the video to learn from Wendy Kirbey, the driving force behind the project and its board chair, when she thinks that day will come. The carousel project has been in the works since about 2002. In recent years volunteers have been beavering away in the nonprofit’s building at Washington Street and First Avenue, carving the 52 wooden creatures that will be installed on the carousel’s historic mechanism once a new building is constructed in the same spot. On the outside wall: A rendition of what the finished building should look like. The carousel organization submitted a site plan for its construction in December. The plan shows the building to be 14,218 square feet, and part of it will take up a little more than 1,000 square feet of the street right of way. This was the plan all along so that the carousel can be seen all the way down First Avenue. City officials and many others hope the carousel will play a big role in revitalizing downtown. The street vacation will take up most of the right lane of First Avenue. The drawing submitted to the council shows that three or four parallel-parking spaces will be lost, but about a dozen diagonal spaces will be created on the carousel side of the street. A decision on the street vacation and the site plan itself, however, is still some time off. That right-hand lane in front of the present carousel building will be taken up by the planned structure and diagonal parking. Did she say how much more tax money will be requested to help pay the $6,000,000 needed for construction? If I recall, there were several large donations of private money made in the past (ex: ~$1m and ~$4m). Are private donations not meeting the need? You stated that as a fact Gordon, as you tend to do on so many things. But you didn’t know that, otherwise you wouldn’t have asked Hasso to find out, would you? You just sought to mislead people by one of your authoritative pronouncements to tarnish both the Carousel folks and the city council in one fell statement. I’m glad you’re leaving Albany. Bob, Your assertion that my intent is to “tarnish” the carousel project is a falsehood. I have long supported this project, as long as it is funded privately and voluntarily. “Projects that catch the spirit of private voluntary associations and volunteerism are inspirational. It is always good to see private people freely spending their time and money on constructive acts of human kindness. Free association and volunteerism are threads knitted deeply into the fabric of our region. But your article ignored how these threads have been frayed by city government. CARA, through its borrowing scheme, gave $410,000 of our property taxes to help buy the carousel property and pay a Portland design firm for conceptual drawings. These monies were diverted from public safety, education, parks, and library. Is the carousel a higher priority than essential services? I welcome differing viewpoints, Bob, even yours. And I won’t call you names or attack you personally. I will aggressively refute your positions, however. It appears opposing opinions make you angry. Well…I have nothing for you on that one. You’ll have to find your own solution to that problem. You treated then as beggars, kind of demeaning don’t you think? You said “millions of taxpayer dollars” which is a fabrication, because you asked Hasso to find out the numbers. You didn’t ask them what their plans were did you? Nope, you grabbed a large attention getting number from somewhere in the recesses of your mind and used a broad brush to paint them. I see you take no offense at tarnishing the city council. Hey guys, what’s with all this bickering? Kudos to Hasso for allowing us to see how much “class” you (don’t) have, Bob. The fact that the city is jumping in and modifying the street pretty much shows that this IS one of their “pet projects”. Who else would be allowed to mess up a street like that? Additional city funds/support are yet to be determined, so it’s a matter of waiting to see if it happens. The City had planned to modify the street in front of the Carousel LONG before the carousel was even thought of! This is a matter of PUBLIC RECORD! This fact, too, completely dismisses your comment of “pet projects.” In fact, the city initially didn’t even want the carousel, thinking it was too much of a mirror image of what Salem had already done. In fact, I wouldn’t be surprised if this street modification is not part of Albany’s comprehensive plan for the downtown. 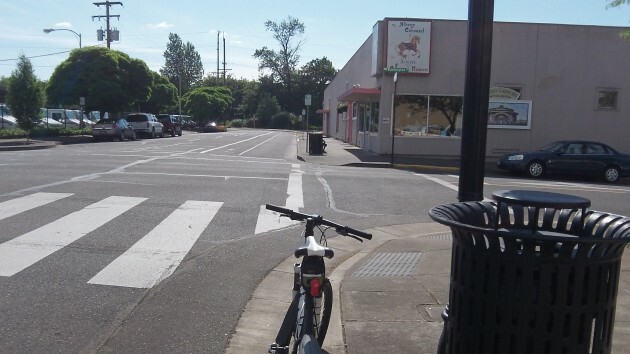 The city’s goal has long been to make the part of First, between Washington and Calapooia, a one lane road – this to allow for head in parking. The ONLY change to this plan is to allow the carousel’s building to extend into part of what would have been some of the parking spaces. It is being done in order to make this structure more visible, and to break up the straight line-of-sight visual one currently gets when looking down this street. And in case you haven’t noticed it, the carousel is truly a centerpiece for Albany’s downtown. As such, having it stand out a little bit does this area good! Thanks for reporting on this Hasso. Did you find out what the status was on the numbers of animals. I thought we had many more years to go until they were all complete (and they take years to make each one). I could be mistaken, of course. But perhaps they plan on starting with a less-than-full complement of animals and then adding them as they are finished? Regarding fund raising. After reading your article this morning, I spent some time thinking about how much I would spend if I could have a lifetime pass to the carousel. This could work out as a fund raiser. So if say, they sold a lifetime pass for $500 each, then one could raise $1,000,000 for each 2000 passes sold. Perhaps that could be a ‘couples pass’ good for my wife and I, or me and one guest whenever I went (So me and my grand-daughter). Or perhaps a larger ‘family pass’ for $1,000 that allows one to bring their family for life. Just a thought. If they do come up short, something like the above would allow property owners (and other residents) to support the carousel directly rather than through the city funds. I am not particularly opposed to the use of city funds for this project though — it seems as valid as funding any of the city parks. Do you know about the operating costs in the future — Is this a private-public partnership or just private or what?